The Redskins came out firing on homecoming. But it wasn’t enough as the first place Hays Indians beat the Liberal Redskins 68-57 Friday night on homecoming in the Big House. The Indians remain undefeated in the WAC while the Redskins are without a WAC win. Liberal jumped out to an 18-17 lead after one quarter. 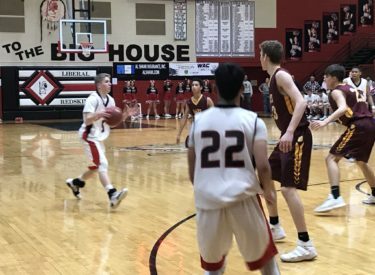 LHS led 30-25 in the second quarter before the Indians used a 7-0 run to lead 32-30 at halftime breaking a string of six straight games the Redskins had led at half. Hays led only 42-40 with 3:49 to play in the third quarter. The Indians led 48-42 after three. Hays quickly made three straight three’s early in the fourth quarter to pull away. The Indians were 11-29 from three point range while the Redskins were 6-21. Kace Vongsakda scored 23 while Cameron Riley had 6. Jordan Mendoza added eight. Hays sweeps the season series for the first time since 2014. The Redskins are 6-10 and 0-5 in the WAC while Hays is 11-5 and 5-0. Liberal plays at Cimarron at about 8 Tuesday night on 1270 and kscbnews.net.